yande and iinsic like this. Trying on a new road racing jacket. Smile!! The kids expression is priceless..."What the hell do you wan't buddy? eh!" Last edited by xjamit; January 25th, 2013 at 08:43. Hi there xjamit. Although you are not the first, this thread is for your face, not your watches', Welcome anyway. Nice face regardless. I got a seamaster PO - skyfall bond model' forgive my ignorance, but how does one post images?? 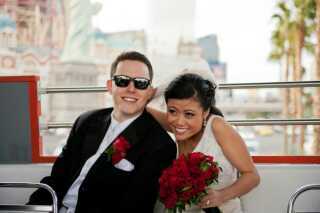 From my Las Vegas wedding last year! joeuk, yande and Rav-4 like this. Wow that looks pretty sweet man!